A promising material could be used to deliver chemotherapy drugs locally to sites where cancerous tumours have been surgically removed. A research team at Northwestern University in the US has developed a promising material that could be used to deliver chemotherapy drugs locally to sites where cancerous tumours have been surgically removed. The flexible microfilm, which resembles a piece of cling film and can be customised easily into different shapes, has the potential to transform conventional treatment strategies and reduce patients’ unnecessary exposure to toxic drugs. To make the specialised film, Dean Ho, assistant professor of biomedical engineering and mechanical engineering at Northwestern’s McCormick School of Engineering and Applied Science, embedded millions of tiny drug-carrying nanodiamonds in the FDA-approved polymer parylene. Currently used as a coating for implants, the biostable parylene is a flexible and versatile material. A substantial amount of drug can be loaded onto clusters of nanodiamonds, which have a high surface area. The nanodiamonds are then put between extremely thin films of parylene, resulting in a material that is minimally invasive. The bottom layer of the material, approximately 20-30 microns thick, serves as the backbone of the device, allowing it to be easily handled. 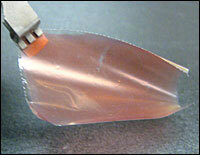 The top layer comprises a thinner semi-porous film that allows the drug to slowly release from the material. To test the material’s performance, the researchers used Doxorubicin, a chemotherapeutic used to treat many types of cancer. They found the drug slowly and consistently released from the embedded nanodiamond clusters for one month, with more Doxorubicin in reserve, indicating a more prolonged release (several months and longer) was possible. The device also avoided the ‘burst’ or massive initial release of the drug, a common disadvantage with conventional therapy. In control experiments, where the drug was present but without the nanodiamonds, virtually all the drug was released within one day. By adding the drug-laden nanodiamonds to the device, drug release was instantly lengthened to the months-long timescale.